We’ve had too many serious and weighty columns recently, so let’s take a break and enjoy some laughs about our bloated and unwieldy federal government. Here’s a cartoon that arrived in my inbox. I can’t decipher who the author is, so feel free to provide the answer in the comments section. Whoever the person is, he or she did a great job capturing both the essence of arrogant and abusive government and the way that government growth generally comes at the expense of the private sector. By the way, I’ve even created a special page for cartoons that characterize government as a bloated, out of shape, and semi-malicious entity. This cartoon has been added to that collection. And here’s a cartoon from Gary Varvel. You’ll notice this cartoon basically has the same theme as this Henry Payne cartoon, this Lisa Benson cartoon, this Chuck Asay cartoon, and these cartoons (here, here, and here) from Michael Ramirez. 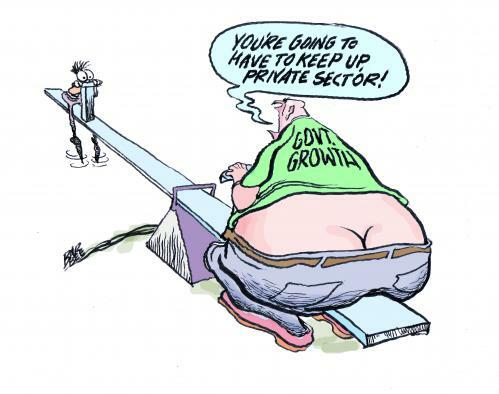 And they all do a great job of capturing how big government holds back the productive sector of the economy. Now let’s look at the best 10 seconds in cinematic history (at least if you’re a curmudgeonly libertarian who frets about bloated government). And don’t forget that Ghostbusters was presumably the only movie ever made where an EPA bureaucrat was one of the bad guys, much to the dismay of some leftists (though I’ve definitely made them the bad guys here and here). Which is why I’m shocked it’s not anywhere on this list of libertarian movies. P.S. Let’s close on a serious point. I haven’t written anything on the events in Ferguson for the simple reason that I wasn’t there and don’t have any special insight or knowledge. So I don’t know if the cop should have been indicted. But I did see a very powerful and fair analysis of the situation. It wasn’t from a sociologist, a criminologist, or any social scientist. It was written by Ben Watson, a tight end for the New Orleans Saints. Here’s a brief excerpt, but I urge you to read the entire thing. And I can’t resist pointing out that Ben was a Georgia Bulldog and he was involved in one of the greatest plays in NFL history (a play that also featured another former UGA player). P.P.S. And since we’ve stumbled into the thorny thicket of race, Walter Williams has some very wise words about the best way of reducing racism. This post hits the nail (government) right on the head. the politics of division… and victimization share a large part of the blame for the events in Ferguson… a young American died… and that is always cause for grief and sadness… but it is a time for the quiet enforcement of the rule of law… and constitutional governance… when the political class….exploits tragedy and human suffering for political gain…. everyone loses…. except of course wealthy and powerful elite… when the smoke clears… Ferguson will be a diminished community… people will suffer from the loss of investment… and business engagement… their tax base will have been reduced… jobs will be lost… and ultimately… the quality of life in the community will be diminished… but the lefty elite and ol’ al Sharpton will do just fine…. and move on to the next tragic event to be exploited and publicized… for political and personal gain…………… what a crock…………………………….